High Point University is a private liberal arts university in High Point, North Carolina, U.S., affiliated with the United Methodist Church. Founded as High Point College in 1924, it became High Point University in October 1991. HPU offers 47 undergraduate majors, 51 undergraduate minors and 12 graduate-degree majors. High Point University was ranked No. 1 among all regional colleges in the south and No. 1 for the most innovative regional colleges in the south in the "America's Best Colleges" 2016 Edition, published by U.S News & World Report. The National Association of Colleges and Employers reported that 95% of the 2015 High Point University graduates were employed full-time or in graduate school within six months of graduation. In the mid-19th century, the Methodist Protestant Church, which is now part of the United Methodist Church, became active in educational pursuits in North Carolina. In 1921, after some years of consideration, the statewide governing body of the Methodist Protestant Church voted to establish a college. Shortly afterwards the church accepted an offer from the citizens of High Point to contribute 60 acres (240,000 m2) of land and $100,000 to the project, placing the new school in the city of High Point. The campus was designed by R. E. Mitchell of Washington, D.C., assisted by Herbert Hunter of High Point, in the English Renaissance style. The school was founded in 1924 as High Point College, a joint venture between the Methodist Protestant Church and the citizens of High Point, and officially opened its doors on September 14, 1924. When the college opened, the campus consisted of three buildings, attended by nine faculty members, with a student enrollment of 122. The steadfast growth that characterized the birth of the College ended abruptly with the Great Depression. This period was difficult for the College in 1932–33, as faculty salaries were cut and expenses were sometimes bartered. Despite a $50,000 fund raising campaign, the College declared bankruptcy on June 15, 1934 and reorganization in an effort to reduce its indebtedness. Subsequent reorganization enabled the College to move forward with business and renewed expansion. On October 9, 1991, under the guidance of President Dr. Jacob C. Martinson, Jr. and the Board of Trustees, High Point College changed its name to High Point University to reflect post-graduate degree programs. Coinciding with the offering of graduate studies, every building on the campus was renovated and new ones were constructed with a campus quadrangle added to replace a former city street that bisected the campus, and by 2004 the University's endowment increased to $40 million. When Jacob C. Martinson, Jr. stepped down as President in 2005, he was the longest serving United Methodist college president in the country. In 2005, the university was only 92 acres and landlocked with a total undergraduate enrollment of 1,450. The university's operating budget was only $35 million with approximately 100 faculty members. Since Dr. Nido R. Qubein became President of High Point University in 2005 the growth of the university has had significant impact on the city, region and the state of North Carolina. Qubein is the fourth highest paid college president, paid $2.9 million a year, in the United States. The Chronicle of Higher Education Almanac, April 19, 2016 noted Nido R Qubein is the third highest donor university president in the country from 2006-2016. He committed $10 million to High Point University. Donations from alumni, parents and supporters of HPU total about $214 million since 2006. In 2010, the university announced plans to invest about $2.1 billion in overall growth in the next decade. To date, High Point University has spent $1.2 billion on four new schools plus facilities, faculty and student services. Ashley Furniture Industries Chairman Ron Wanek donated $10 million to High Point University in 2013 after visiting HPU's president Dr. Nido R. Qubein. Wanek's gift to the university is the 10th contribution of $10 million or more that Qubein has received during his tenure. On September 14, 2014, the university celebrated its 90th anniversary. As part of the commemoration, 90 facts about the university were featured in the News and Record on High Point University's Founders Day. On January 3, 2015, Nido R. Qubein celebrated his 10th anniversary as president of High Point University. In April 2016, High Point University announced plans to invest 160 million in new building projects  including a 5,000-seat arena and conference center, undergraduate science center and residence hall. Together, Greensboro, High Point, and Winston-Salem, along with the surrounding suburbs and townships, form the Piedmont Triad region, an area with a population over 1.5 million. Of that number, approximately 108,285 live in High Point. Both Greensboro and Winston-Salem are twenty minutes from campus. East of the University are Raleigh (1½ hours away) and the Atlantic Ocean (3½ hours away); south of the University are Charlotte (1½ hours away) and Atlanta, Georgia (5 hours away); west of the University are the Appalachian Mountains (2 hours away) and north is Washington, D.C. (5 hours away). In 2015, High Point University had a student-to-faculty ratio of 14:1 and a student retention rate of 76.5%. The average class size is fewer than 20 students and no student teachers or teacher assistants instruct classes. In 2015, High Point University was ranked #1 in the annual U.S. News & World Report Regional Colleges South rankings. In the 2016 rankings released HPU ranks #1 Best Regional College in the South for the fourth consecutive year and #1 Most Innovative Regional College in the South. In the Forbes Magazine listing, "America's Top Colleges," High Point University was ranked 559th nationwide out of 650. Forbes magazine only selected 650 out of 4,000 universities to rank. In August 2013, Affordable Colleges Online ranked High Point University No. 8 among 35 colleges in North Carolina based on the return on investment versus the cost of tuition and fees. Schools at High Point include the David R. Hayworth College of Arts and Sciences, the Phillips School of Business, the Plato S. Wilson School of Commerce, the Nido R. Qubein School of Communication, the School of Art and Design, the School of Health Sciences, and the School of Education. A School of Pharmacy is projected to open in 2017. In the summer of 2016, a High Point University Biology student assisted scientists in research at Kepley BioSystems Inc. to create sustainable eco-friendly fish bait. The student was selected and funded through the National Science Foundation's Research Experience for Undergraduates. The School of Education opened in August 2012. The building is 31,000-square-foot and includes smart boards, a children's book library, math and science touch screen games, a methods lab designed to look and feel like a real elementary school classroom, a Mac lab, and psychology research booths. Students have the option of majoring in Elementary Education, Health and PE, Middle Grades Education or Special Education. There is also a Master of Education in Educational Leadership and a Doctoral Degree Program in Educational Leadership. The School of Art and Design includes academic majors in Graphic Design, Interior Design, Studio Art and Visual Merchandising Design. Minors include Art History, Graphic Design, Furnishings and Product Marketing, Photography, Studio Art and Visual Merchandising Design. The Interior Design program is part of the Knabusch-Shoemaker International School of Home Furnishings and Interior Design and has two computer-assisted design (CAD) labs, a library and gallery to ehibit student work. The Interior Design Program is accredited by the Council for Interior Design Accreditation (CIDA). The new HPU School of Health Sciences and School of Pharmacy are currently two of the university's biggest illustrations of ongoing expansion. HPU has invested $80 million into a 170,000-square-foot building to house both programs. In 2012 Dr. Ronald Ragan accepted the position of Professor and Founding Dean of the School of Pharmacy at High Point University. He is responsible for the design and development of the new School of Pharmacy, including accreditation of the program and construction of a new Pharmacy Building. Dr. Ragan was recruited from the University of Kansas. In addition to Dr. Ragan, the School of Pharmacy boasts notable faculty members Dr. Peter Gal - Associate Dean for Academic Affairs, Dr. Earle Lingle - Associate Dean for Student and Professional Affairs, Dr. Scott Hemby - Chair of Basic Pharmaceutical Sciences, and Dr. Joy Greene - Assistant Dean for Experiential Education. High Point University's School of Pharmacy was recently featured in US Airways Magazine and Our State Magazine. Annually, the top sixteen incoming communication majors are granted membership into High Point University’s Media Fellows Program. The Media Fellows Program application is available to students who plan to major in Journalism, Electronic Media, Strategic Communication, Games and Interactive Design or Media and Popular Culture Studies. In March 2015, High Point University announced that former Today Show producer Joe Michaels would be joining the Nido Qubein School of Communication as an artist-in-residence. Joe Michaels is a seven-time Emmy Award-winning director and a two-time Directors Guild of America Honoree. Other notable faculty in the School of Communication include Charisse McGhee-Lazarou, former vice president of Primetime Programming at NBC. David Neal, a 34-time Emmy Award-winning producer and Fox’s World Cup Coordinator serves on the Nido Qubein School of Communication advisory board. Each year 16 incoming communication majors are granted membership into High Point University’s Media Fellows Program through the Nido R. Qubein School of Communication. Media Fellows live in a living-learning community their freshman year and have options to travel abroad. During their college career, Media Fellows also participate in summer internships at national media companies, participate in seminars related to their major and produce a Capstone project their senior year. In June 2015, High Point University welcomed its first class of students enrolled in the physician assistant program. Only 20 students were selected from a pool of 800 applicants and they will graduate in 2017. The program will begin each summer and will span 27 months over 7 continuous semesters. In 2017, the program will be housed in HPU's new of Health Sciences and School of Pharmacy building. The program then will be able to expand to 35 students. High Point is the ninth North Carolina college to offer a physician assistant program. Two others are in the works, including one at UNC-Chapel Hill. HPU's Physician Assistant program features a state of the art simulation lab featuring iStan, a high fidelity mannequin that can communicate, sweat, bleed, and respond to treatments. Aside from the clinical simulation lab, the space also includes three real-life patient examination rooms, a traditional classroom, and a clinical skills lab. On June 7, 2015, the students participated in the traditional "white coat" ceremony to mark the beginning of their training. In the class of 2014, there were 54 students who received the titles of either National Merit Scholars, valedictorians, salutatorians or high school student government presidents. 307 students had Advanced Placement Courses from high school, earning over 1272 credit hours in 23 different subjects. Several students earned the distinction of Eagle Scout or Gold Award recipient during high school, and there were 15 languages spoken fluently among the class. The top ten states represented by the class were North Carolina, Maryland, New Jersey, Massachusetts, New York, Pennsylvania, Connecticut, Virginia, Ohio and Florida. The class is 74% Caucasian, 6% African American, 3% Hispanic or Latin American, 1% Asian or Asian-American, and 16% Other. High Point University is a residential campus by design, with 19 residence halls in total. In 2015 Business Insider ranked High Point University #4 in the nation for best residence halls. 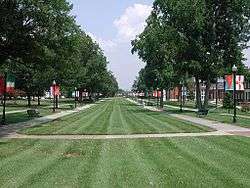 All High Point University students are required to reside on campus until they have reached senior status, unless they commute from their parent's permanent address. High Point University has 12 dining locations on campus including 5 restaurants, Chick-fil-A, Subway, 3 convenience stores and 2 Starbucks. In November 2015 High Point University made Business Insider's list of the 20 colleges with the best dining halls. Students who have utilized the Office of Career and Professional Development have landed internships at regional, national, and global organizations such as Ashley Furniture, CBS, CNN, Hearst Magazines, Living Social, Michael Kors, Microsoft, NASA, Scholastic Parent and Child Magazine, Vineyard Vines, Good Housekeeping, Paramount Studios, Pfizer Pharmaceuticals and more. Students are provided with Access to Innovators, which has brought scores of world-renowned thought-leaders and speakers to campus, including Mitch Albom, Steve Forbes, Malcolm Gladwell, Seth Godin, John C. Maxwell, Thomas Friedman, Ken Dychtwald, and CNN Justice Correspondent Pamela Brown (journalist). Guest speakers are selected to provide students and the community the opportunity to understand diverse viewpoints, positions and backgrounds. Recently, Marc Randolph, the co-founder of Netflix. and Biz Stone, the co-founder of Twitter. While Marc was on campus he took part in a question-and-answer session titled “A Discussion with High Point University President Nido Qubein” and spent time in the Belk Entrepreneurship Center to review High Point University students’ business concepts. Biz also took part in a discussion with President Nido Qubein and spent time with communication and entrepreneurship students. The Cultural Enrichment Series was named the Community Enrichment Series in 2014. Guests to campus in the 2014-2015 year included Dutch artist Theo Jansen, digital art pioneer Barbara Nessim, sports television announcer Bob Rathbun, Navy Seal Rob O'Neill, pianist Marvin Blickenstaff, and artist Mariyah Sultan. These events are open to students, faculty, staff, and the surrounding community. Most recently, High Point University announced that Steve Wozniak, the co-founder of Apple Inc. computer, has on a new role as High Point University’s Innovator in Residence. Through an ongoing partnership, Wozniak will connect with HPU students and visited campus on March 23, 2016. The partnership with Steve Wozniak stems from High Point University's focus on providing access to innovators for students. Interfraternity Council (IFC) - Pi Kappa Alpha, Pi Kappa Phi, Beta Theta Pi, Kappa Alpha Order, Kappa Sigma. In recent years, the number of study abroad programs (64) has expanded exponentially since 2005. High Point University offers semester-long programs to Argentina, Australia, Austria, Czech Republic, Ecuador, England, Fiji, France, Germany, India, Italy, Japan, Russia, Scotland, South Africa, Spain and Wales. Students can study abroad as early as their freshman year at High Point University. In addition to traditional study abroad programs, High Point University also offers Global Experience programs. These "Maymester" programs are short-term study abroad programs led by High Point University faculty members. Colin L. Powell was selected as the 2014 Commencement speaker. Prior to his appearance on campus, Colin Powell gained the university and city of High Point national publicity. The news network CNN ranked High Point University and Colin Powell’s address as fifth in the country for a segment titled "2014’s Big-Name College Commencement Speakers." The morning of commencement, ABC News streamed the entirety of High Point University's graduation ceremony live on their news website. Additionally, The Huffington Post featured a video of Powell's commencement speech citing key pieces of advice he shared with the High Point University Class of 2014 on May 3. In August 2014, High Point University announced that the distinguished journalist Tom Brokaw, best known as the anchor and managing editor for NBC Nightly News, would be the 2015 commencement speaker. Before the commencement weekend, he made USA Today's list of 'Most Prominent College Graduation Speakers of 2015'. The Huffington Post highlighted Brokaw's speech which urged High Point University graduates to be a new generation that sees past race, gender and superficial lines that divide. In May 2016, Condoleezza Rice, 66th Secretary of State, served as the Commencement speaker. High Point University President Nido Qubein believes that "Secretary Rice has served this country in measurable ways through her work in our nation’s capital, in free enterprise, in academia and in efforts to improve education for children. She embodies the American spirit and its core values, which we proudly celebrate on our campus." Condoleezza Rice joined President Nido Qubein in a question-and-answer session on Friday, May 6 and addressed the Class of 2016 at High Point University's Commencement ceremony on Saturday, May 7, 2016. In August 2016, High Point University announced that journalist and television news anchor, Wolf Blitzer , of CNN's The Situation Room will serve as the 2017 Commencement Speaker. Throughout the years, other special guests have included former President Bill Clinton, social and political analyst Armstrong Williams, baseball hall of fame recipient Cal Ripken Jr., author Chris Gardner, Olympic gold medalist Jennifer Azzi, former George W. Bush advisor Karl Rove, Grammy award winning singer Lee Greenwood, physician Patch Adams, and best-selling author Stedman Graham. Local speakers include North Carolina governor Pat McCrory and Richard Childress, president and CEO of Richard Childress Racing. Speakers have also included Tony award-winning composer Charles Strouse and Steve Harvey. The National Board of Advisors is composed of Fortune 500 CEOs and thought leaders who have impacted the United States of America and the world in significant ways. Most recently, HPU announced they have appointed Anthony Atala of Wake Forest Institute for Regenerative Medicine to their National Board of Advisors. Other distinguished members include General Colin Powell and Steve Wozniak, Dr. James Moeser, chancellor emeritus at the University of North Carolina at Chapel Hill; Ron Wanek, founder and chairman of Ashley Furniture; Marty Flanagan, president and CEO of Invesco Ltd.; Kelly King, chairman and CEO of BB&T; Bonnie McElveen-Hunter, CEO & Owner of Pace Communications, Chairwoman of the American Red Cross and former U.S. Ambassador to Finland; Kurt L. Darrow, President and CEO of La-Z-Boy; Rich Handler, CEO and Director of Leucadia and CEO and Chairman of the Board for Jeffries Group; Tim Belk, chairman and CEO of Belk Stores, and David King, CEO of LabCorp. In 2014, an article in The High Point Enterprise stated that the iPads donated to Montlieu Academy had positive results. In 2015 High Point University President Nido Qubein announced that HPU would make the lead gift of $100,000 for a local YMCA Splash Park. The Splash Park will give children in the High Point community a place to stay cool and healthy over the summer. In 2016, the Charl Chavis YMCA in High Point hosted the grand opening of the Splash Park where HPU dedicated the park in honor of Carlvena Foster, executive director of the YMCA and a High Point University alumna. The 2010–11 season was the most successful since High Point University joined NCAA Division I in 1999–2000. In the fall, the women's soccer team and women's volleyball team won Big South Tournaments and the men's soccer team won the Big South regular season. In the spring, the women's lacrosse team won the National Lacrosse Conference tournament and set a record for wins by a first-year program, with 15. The 2010-2011 women's lacrosse team success led to other accomplishments in 2013. The assistant women's lacrosse coach Lauren Norris was selected to coach the 2013 Israel National Lacrosse Team in the 2013 FIL Women's World Cup. High Point University also fields the following sports at the club level: men's and women's basketball, men's and women's golf, men's and women's lacrosse, men's and women's rowing, running, men's and women's soccer, men's and women's swimming, men's and women's tennis, women's field hockey, softball, ultimate frisbee, equestrian and ice hockey. Donations to High Point University's Athletic Department have exceeded $30 million. The primary athletics facilities at High Point University are the Millis Center (basketball, volleyball), Williard Stadium (baseball) and the Witcher Athletic Center at Vert Stadium (track, soccer, lacrosse). In July 2016, The Big South announced The 2015-2016 Presidential Honor Roll, where High Point University Athletics had the highest percentage of 3.0 GPAs. A permanent collection of original works donated to the University by High Point Alumnus Darrell L. Sechrest. Among others, the permanent collection includes works by Christian Dietrich, Sir Lawrence Alma-Tadema, Sir Joshua Reynolds, Allesandro Gherardini, El Greco, George Harvey, Emile Louis Picault, Elsie Popkin, and Antonio Zucchi and Angelica Kauffman. The gallery is housed within the Hayworth Fine Arts Center. Since taking office in 2005, President Nido Qubein has been adding campus buildings and creating student amenities such as concierge services, an on-campus steak house, free carwashes, and an icecream truck. In early 2012 Businessweek reported that about $700 million in new building and campus upgrades was financed by heavy borrowing and Moody’s Investors Service downgraded the school’s bonds to junk status in 2009 due to the school's position as one of the most heavily leveraged colleges in the country. The U.S. Department of Education's "financial responsibility" score for the 2012 and 2013 fiscal year has High Point University scoring the highest possible score of 3, putting the university ahead of Elon University, Duke University, and Davidson College. Businessweek responded by inviting the school to make financial documents available to support any challenges to the article's accuracy, but none were offered in response. In addition to questioning debt levels, Businessweek challenged whether the school's relationships with its lenders and vendors were at an appropriate arm's length, citing in particular that the school spends large marketing dollars with a public relations firm headed by the president's daughter. The college's claims to a growing reputation in higher education were challenged as being based more on high-end student amenities and marketing strategy than on solid academics. ↑ As of June 30, 2011. "U.S. and Canadian Institutions Listed by Fiscal Year 2011 Endowment Market Value and Percentage Change in Endowment Market Value from FY 2010 to FY 2011" (PDF). 2011 NACUBO-Commonfund Study of Endowments. National Association of College and University Business Officers. Retrieved June 16, 2011. ↑ "High Point University". Retrieved August 15, 2015. ↑ "Regional College South Rankings | Top Regional Colleges South | US News Best Colleges". colleges.usnews.rankingsandreviews.com. Retrieved 2016-05-27. ↑ "Most Innovative Schools | Regional Colleges South | US News Best Colleges". colleges.usnews.rankingsandreviews.com. Retrieved 2016-05-27. ↑ "Rhino Times - June 19, 2014". Retrieved August 15, 2015. ↑ StartClass, Nido Qubien -- High Point University #4, Retrieved December 14, 2015, "...Total Compensation: $2,909,148.."
↑ Jean Stancill, December 8, 2015, News & Observer, The president of High Point University ranked as the third highest-paid university president in the country, according to a Chronicle of Higher Education report on 2013 data, Retrieved December 14, 2015, "....."
1 2 3 "Can High Point University fly higher?". Triad Business Journal. May 23, 2014. Retrieved August 15, 2015. ↑ "Page Not Found - HP® Official Site". Retrieved August 15, 2015. 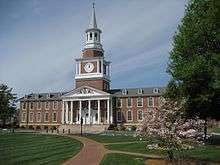 ↑ "High Point University unveils plan to 'lead the way' with $160M in new building projects - Greensboro - Triad Business Journal". Triad Business Journal. Retrieved 2016-05-27. ↑ High Point University. "Undergraduate Admissions". High Point University - Undergraduate Admissions. Retrieved August 15, 2015. ↑ "America's Top Colleges". Forbes. Retrieved August 15, 2015. ↑ "Online Colleges in North Carolina - AffordableCollegesOnline.org". Retrieved August 15, 2015. ↑ "NASA invites High Point University students to test device". Greensboro News & Record. Retrieved August 15, 2015. ↑ "School of Pharmacy associate dean leaving KU for top spot with new program". Retrieved August 15, 2015. ↑ High Point University. "HPU Welcomes Gal as Associate Dean for Academic Affairs for the School of Pharmacy". High Point University. Retrieved August 15, 2015. ↑ High Point University. "School of Pharmacy Welcomes Lingle as Associate Dean". High Point University. Retrieved August 15, 2015. ↑ High Point University. "Hemby Joins School of Pharmacy". High Point University. Retrieved August 15, 2015. ↑ High Point University. "Greene Joins School of Pharmacy". High Point University. Retrieved August 15, 2015. ↑ High Point University. "ISSUU - High Point University Feature in US Airways Magazine by High Point University". Issuu. Retrieved August 15, 2015. ↑ High Point University. "ISSUU - Our State Magazine HPU Feature October 2013 by High Point University". Issuu. Retrieved August 15, 2015. ↑ "High Point University welcomes first students in physician assistant program - Greensboro - Triad Business Journal". Triad Business Journal. June 5, 2015. Retrieved August 15, 2015. ↑ "High Point University starts physician assistant program". Winston-Salem Journal. Retrieved August 15, 2015. ↑ HPU's PA Program Opens State of the Art Simulation Lab. YouTube. May 14, 2014. Retrieved August 15, 2015. ↑ "Meet Stan. He cries, sweats, talks and pees. And he's a mannequin". Retrieved August 15, 2015. ↑ University, High Point (2015-06-07). "HPU Hosts Inaugural White Coat Ceremony and Welcomes First Class of PA Students - High Point University". High Point University. Retrieved 2016-05-15. ↑ High Point University. "Freshmen Class Profile". High Point University - Undergraduate Admissions. Retrieved August 15, 2015. ↑ "Twitter (NYSE: TWTR) co-founder Biz Stone to speak at High Point University - Greensboro - Triad Business Journal". Triad Business Journal. Retrieved 2016-05-27. ↑ "Sportscaster Bob Rathbun Shares Industry Expertise at HPU". Retrieved August 15, 2015. ↑ David Ford. "Sechrest Gallery Presents "Elemental Emulsions: Mariyah Sultan Paintings"". Retrieved August 15, 2015. ↑ University, High Point. "Apple Co-Founder Steve Wozniak Becomes HPU's Innovator in Residence". GlobeNewswire News Room. Retrieved 2016-05-27. ↑ High Point University. "Greek Life". Greek Life. Retrieved August 15, 2015. ↑ Jamie Gumbrecht, CNN (April 25, 2014). "College commencement speakers for 2014 announced - CNN.com". CNN. Retrieved August 15, 2015. ↑ "Congress Needs To Stop And Listen To Colin Powell's Commencement Speech (VIDEO)". The Huffington Post. Retrieved August 15, 2015. ↑ "Most prominent college commencement speakers of 2015 - USA TODAY College". USA TODAY College. Retrieved August 15, 2015. ↑ "Tom Brokaw: We Can't Fulfill America's Promise If We Are Blinded By Color". The Huffington Post. Retrieved August 15, 2015. ↑ Hill, Jarred. "Condoleezza Rice speaks at HPU graduation". WXII12. Retrieved 2016-05-27. ↑ Anthony Atala. "Anthony Atala: Growing new organs - TED Talk - TED.com". Retrieved August 15, 2015. ↑ High Point University. "National Board of Advisors Adds Dr. Anthony Atala". High Point University. Retrieved August 15, 2015. ↑ "Schultz selects D-1 baseball". troyrecord.com. Retrieved April 10, 2015. ↑ "Jersey City educator named N.J. charter school teacher of the year". www.nj.com. Retrieved 2016-07-23. ↑ University, High Point (2016-05-12). "Carl Chavis YMCA Opens Splash Park for Children in High Point - High Point University". High Point University. Retrieved 2016-05-27. ↑ High Point University Panthers - High Point leads Sasser Cup standings after fall. Highpointpanthers.com (2010-12-01). Retrieved on 2013-08-09. ↑ High Point University Panthers - HPU women's lacrosse finishes season with loss to No. 2 UNC. Highpointpanthers.com (2011-05-06). Retrieved on 2013-08-09. ↑ High Point University Panthers - Club Sports at HPU. Highpointpanthers.com. Retrieved on 2013-08-09. ↑ "High Point University Panthers - HPU dedicates Witcher Athletic Center". High Point University. Retrieved August 15, 2015. ↑ "High Point University" (PDF). Retrieved August 15, 2015. ↑ "Financial Responsibility Composite Scores". Retrieved August 15, 2015.